Extended Day now includes a morning 8:00-9:00 option. Through our SummerFun! program, Arlington Community Education offers more than 100 enrichment classes taught by experienced classroom teachers. Designed to appeal to kids of all interests, we will help you create the perfect summer for your child. Many classes fill quickly so please register early. SummerFun! is open to residents of Arlington and surrounding communities. Free supervised lunch/recess period included for students who do both AM/PM classes. For registration or other issues, please call our main office at 781-316-3568. You can email us at CommunityEd@Arlington.k12.ma.us. 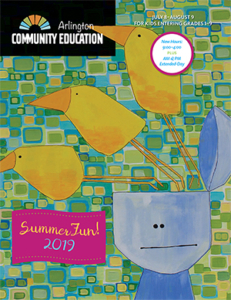 SummerFun information is also posted on our website at ArlingtonCommunityEd.org. Follow us on Facebook (ArlingtonCommunityEd) and Twitter (@ArlingtonCommEd). Both residents of Arlington and non-residents are welcome to enroll in our classes at the same low tuition. Registration opens as soon as the classes are posted online and continues until the first meeting of any class, as space permits. There are no waitlists for half day classes. Under-enrolled classes are cancelled, so register early. All grade levels listed represent the grade your child will be in the Fall 2019. Please make sure you enroll your child in the appropriate class for his/her grade level. Children must be picked up promptly at end of class. A late fee of $1 per minute is charged for students remaining at the school beginning five minutes after class (or extended day) ends. Supervised lunch period runs from 12:00-1:00 pm and is included for students enrolled in both AM and PM classes; other students may stay for lunch for $10 per day; see the Director to make arrangements. Note: All children must bring their own lunch, snacks, and beverage each day. Supervised lunch is available at Ottoson, only. Extended Day offers supervised activities and free-play from 8:00-9:00 AM and 4:00-5:30 pm (no PM program Fridays). Extended day is offered at Ottoson only. Call or text 617-800-4245 prior to 8:15 am if you child will be absent or late. Text is preferred. Please include child’s name and all classes. 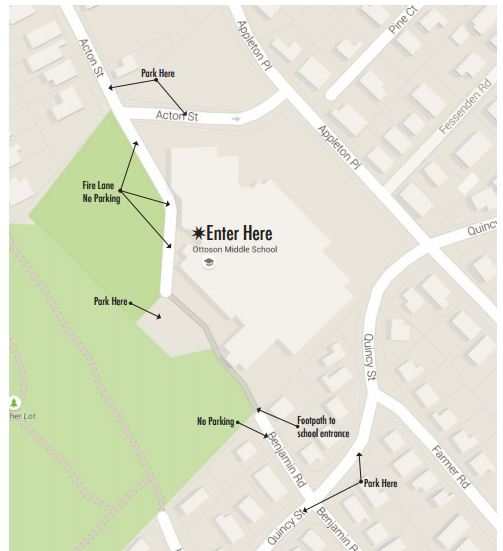 Or, you can email us before 8am at CommunityEd@arlington.k12.ma.us. There is limited parking in the school parking lot along with several handicap spots. The lot gets very crowded at drop off so if you are in a hurry, we highly recommend you park on side streets. You may not park your vehicle directly in front of the school entrance–this area is for active drop-off only on the school side of the street only. 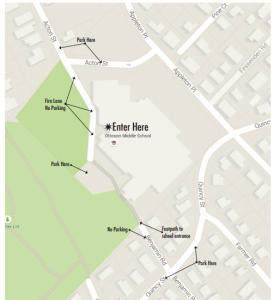 Parking is allowed on Acton St. (before entering school driveway) and Quincy St. If you park on Quincy, enter school via footpath at the end of Benjamin Rd. See parking map. Please note the ‘no parking’ areas. Except for those registered for Extended Day, students will be allowed in the building 5 minutes prior to the start of each class. Upon entering the building, class locations will be listed on the board. Students should follow signs directly to their classes and staff will be there to help direct you. On the first day, children entering grades 5 and below must be escorted to their classrooms. For the remainder of the week, children entering grades 3 and up may check themselves in. Children entering grades 6-9 may check themselves in and out each day. We assume children entering grade 6 or above can be released without an adult. If you have not authorized your child entering grade 5 or below to walk home alone (on registration form), meet your child in his/her classroom at the end of your child’s day. You or an authorized adult are required to sign your child in and out daily and provide your FAMILY CODE (details provided through confirmation email week prior to class). Children MUST be picked up on time! This means 12:00 pm for morning classes; 4:00 pm for afternoon classes, or 5:30 pm for extended day. After a 5 minute grace period, you will be charged $1-per-minute, payable immediately to the staff member waiting with your child. These are posted in the Main Lobby of Ottoson Middle School and staff will be there to help. Children should wear comfortable, casual clothes and shoes. In some classes they get messy! All items brought to SummerFun! should be clearly marked with your child’s name; we cannot be responsible for lost items. Each day, children must bring a snack and water bottle. Children remaining for lunch must also bring a packed lunch, water bottle and afternoon snack. SummerFun! is an equal access programs. We do not discriminate against children with disabilities. We encourage parents to disclose any medical or disability-related needs on your child’s registration form. If you believe your child requires a specific reasonable accommodation for medical or disability-related needs, please contact our office to discuss your child’s needs. Please note that SummerFun! is not a school-sponsored special education programs so children are not entitled to the same IEP services and accommodations during programming. Children who attend SummerFun! should be able to participate in group activities with teacher supervision and treat fellow students and staff with respect. If a child is unable to do so, the teacher or director will contact parents to discuss appropriate next steps. You are officially enrolled as soon as we receive your registration form and payment. If you provide us with your email address, you will receive a confirmation. A $6 registration fee is charged once per person per term. Withdrawals must be made via email to CommunityEd@arlington.k12.ma.us. Refunds will be issued minus a $25 fee per student, per class for withdrawals made by March 31. The fee is $50 per student, per class, April 1–May 31. NO REFUNDS WILL BE ISSUED AFTER JUNE 1. A $15 switch fee is assessed for each requested change in a child’s registration. No refunds will be made for classes missed or dropped. All money is returned if ACE cancels a class. If we do not meet the minimum number of students required to run a class, we will cancel the class and notify parents. Every effort will be made to place the child in another class. Tuition assistance is available for some classes for APS students who receive free and reduced lunch. Please contact Food Services to obtain your official letter before contacting us. Registration must be done over the phone or in person only. Please call 781-316-3568 for more information. ACE occasionally takes photos of classes for use in catalogs, advertising and other promotional materials. If you do not wish to have your child photographed by ACE, please notify the office before your child’s program begins. SummerFun! staff will be situated at Ottoson for the duration of the program. To reach staff by phone for any urgent matters, please call 617-800-4245. You can also email staff at CommunityEd@arlington.k12.ma.us or speak to us in person at our table in the lobby. SummerFun! is a program of the Arlington Public Schools and Arlington Community Education. Registration Opens 2/14 at Noon!